Lighted Angel Figurine Frosted - LED Color Changing Praying Angel Statue With Large Color Changing LED Wings. Item size is 8.5"H x 3.75"L x 3.75"W TABLETOP DECORATION: Color-Changing LED white clear frosted Praying Angel with Large feather wings. Stunning angel centerpiece. Use for Christmas decoration, holidays, parties or angel gifts. ANGEL DECORATIONS: Eye catching sparkling detailed xmas decoration featuring LED lights. UNIQUE GIFT IDEA: Give this as a gift to mom, grandma, sister, aunt and or friends. It can also be used as a memorial gift to remember a special friend or family member. 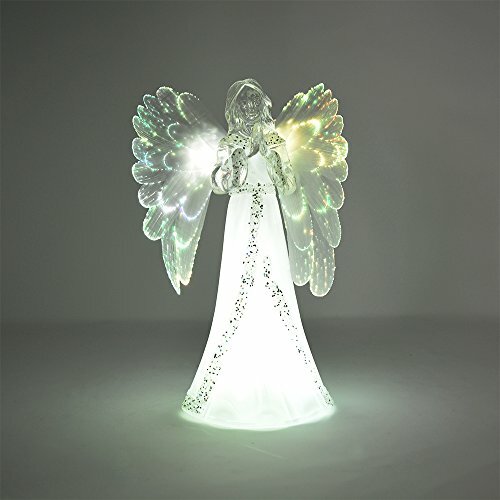 LED COLOR CHANGING ANGEL & WINGS: Brilliant changing colors White, Pink, Green and Blue. The color changes extend out to the wings and edges giving the Angel and Wings brilliant appeal. DECORATIVE USES: Makes a great accessory for any Christmas holiday decor application. Give as a gift or display as a tabletop centerpiece, on a fireplace mantel, shelf or window decoration. Sold exclusively by The Nifty Nook. Requires 3 AAA batteries (not included). Dimensions Approx: 3.75"W x 3.75"L x 8.5"H. Open Wing Width: 5.5". Item Size: 8.5"H x 3.75"L x 3.75"W TABLETOP DECORATION: Color-Changing LED white clear frosted Praying Angel with Large feather wings. Stunning angel centerpiece. Use for Christmas decoration, holidays, parties or angel gifts. ANGEL DECORATIONS: Eye catching sparkling detailed xmas decoration featuring LED lights. UNIQUE GIFT IDEA: Give this as a gift to mom, grandma, sister, aunt and or friends. It can also be used as a memorial gift to remember a special friend or family member. LED COLOR CHANGING ANGEL & WINGS: Brilliant changing colors White, Pink, Green and Blue. The color changes extend out to the wings and edges giving the Angel and Wings brilliant appeal. DECORATIVE USES: Makes a great accessory for any Christmas holiday decor application. Give as a gift or display as a tabletop centerpiece, on a fireplace mantel, shelf or window decoration. If you have any questions about this product by The Nifty Nook, contact us by completing and submitting the form below. If you are looking for a specif part number, please include it with your message.